With epiNote HD your iPad becomes an electronic canvas on which you can draw, write and/or type text to produce a screen image. You can also import and include photos, website clippings, maps and icons. Or, you could open documents (such as .pdf, .doc, .xls and .ppt files) and paste a section of the document to your screen for marking up. Once you have placed content on your screen, you can re-organize its layout using a selection tool to assemble, craft and compose your page. 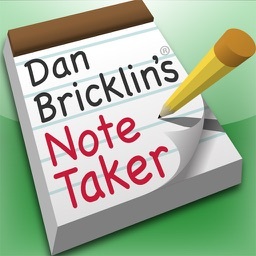 Used as a note taker, you can "write small" with your finger or stylus and make full use of the entire screen space. The auto-advance feature lets you write continuously with minimal disruption. Whether you're drawing or writing, it's quick and easy to change pens, colors, thicknesses or highlighters and there's a unique eraser feature which lets you do very precise clean up jobs without your finger getting in the way. You can mark up annotate or caption photos using multi-colored highlighters. Make it snazzy with the cool free icons. Then re-size, rotate and re-position content anywhere you want on the screen. Tidy up as you write, or re-arrange your composition later when you review your notes. Organize your work in folders and back it up on Dropbox, or email it as a jpg or png file. 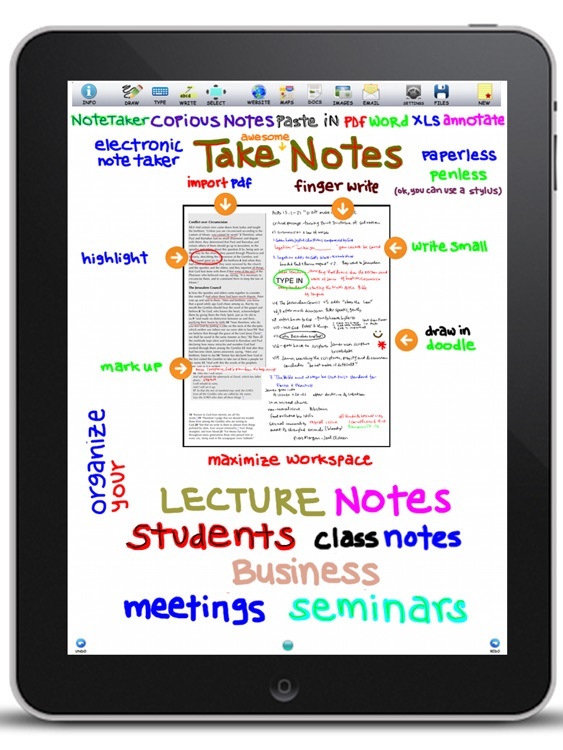 Students, use epiNote for serious note-taking in lectures. 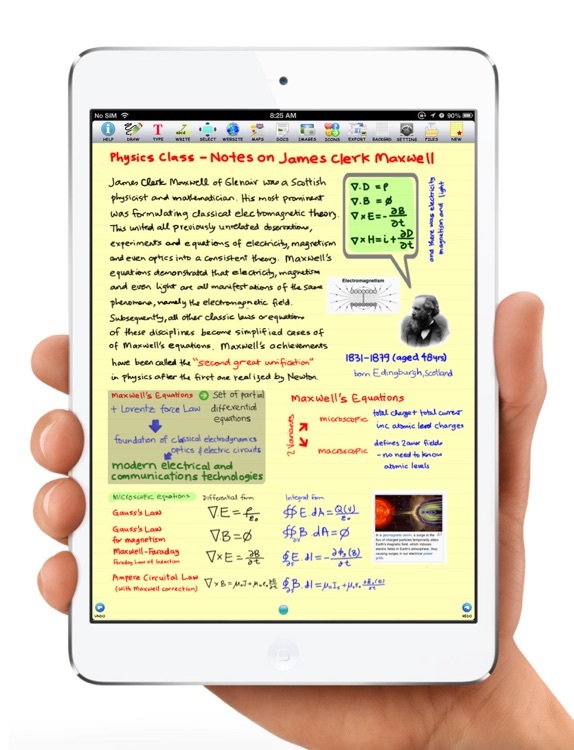 Teachers, use epiNote to prepare lessons and mirror the iPad screen on a projector or LCD monitor (requires iPad 2). Business users, illustrate, visualize and brain storm your ideas in meetings and create documentation content. 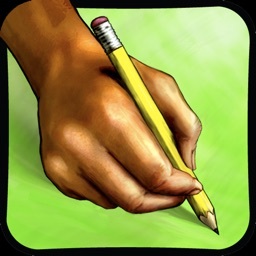 Freestyle finger draw anywhere on the screen with an infinite choice of pen and highlighter combinations. Use the write mode to "write small". Write naturally on the screen and your writing will be automatically "zoomed" or scaled to fit a smaller area which you can adjust, stretch and position. 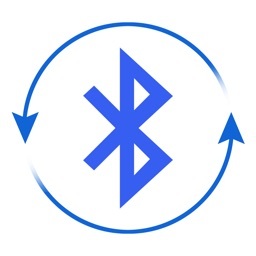 The auto-advance feature allows you to write continuously with minimal disruption. Right to left writing is supported for other languages. Or simply type. There's a full range of fonts and colors. There's a great eraser tool with configurable offsets for detail clean up work. Our adjustable width eraser tool lets you specify an offset so you can see what you are erasing. epiNote has great tools for you to shuffle content around. Select almost anything on the screen using the selection box. Move it around, re-size the selection box or rotate it and then paste it anywhere on the screen . Bring in maps and photos. With the selection tool, you can crop anything you import, resize, rotate and place content anywhere you wish. The embedded browser allows you to access websites and search for images and content. 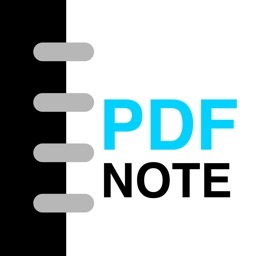 epiNote allows you to import pdf, doc, xls and ppt files. 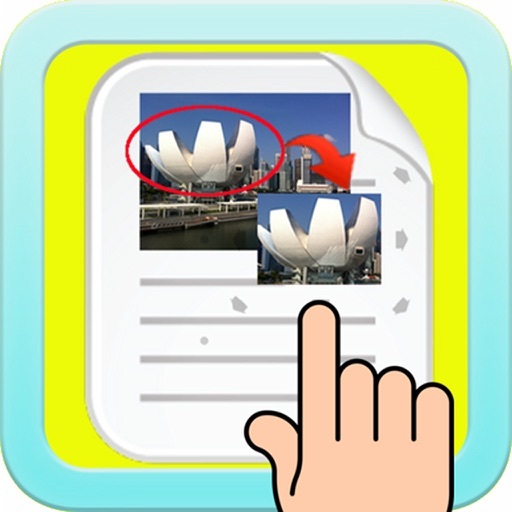 You can crop to the section you wish to use, paste it in your note for marking up or highlighting. Options include print, Document interaction ("Open in …"), email, Photo album, Facebook, Pasteboard. Impress by polishing off your notes with our VERY COOL FREE icons. Or customize by creating and using your own icons. Download the free icon set from our website. You can open any file as a background and create your own underlay, ruled sheets, graph paper, grids, templates etc. 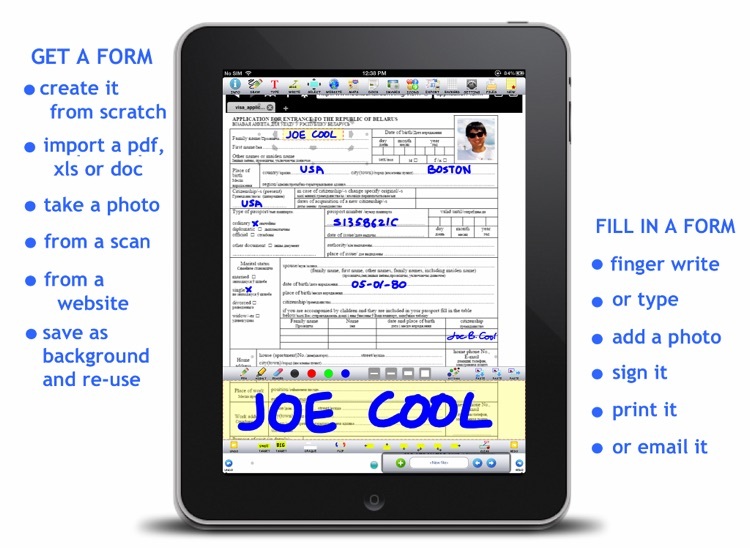 You could also use backgrounds to fill in forms, for example, take a photo of a form and open it as a background, write onto it and sign it off. Erase mistakes without erasing the form. Finally, merge the completed form with the background and email it off.